Taekwon-Do empowers those who learn it properly. They feel better about themselves, about their lives and about the world in which they live. 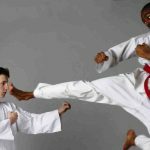 Taekwon-Do is a modern and spectacular martial art that focuses on self-defence through developing physical prowess and positive mental training. Developed by a Korean General in the early 1950s, it is renowned for its fast footwork and is often mistaken simply for just a kicking art. However, real Taekwon-Do is much more complex. 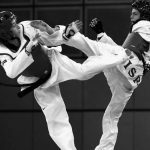 Taught and practiced correctly, it’s blocking, striking and grappling techniques make for a diverse combat style and allow people to defend themselves against multiple opponents. Equally important, Taekwon-Do has its roots in a strong moral culture: practitioners learn such virtues as humility, respect for others, civic duty, responsibility and integrity. The beauty of Taekwon-Do is that it can be learnt by anyone, irrespective of age, gender or physical fitness. It doesn’t rely on brute force or size and you can start to learn at age three or 63. As long as you are willing to learn and ready to adopt the core philosophies of this unique art, then we can teach you. We also offer training advice if you’re suffering from a disability or a previous injury. Mazuki instructors are highly trained practitioners and expert teachers. Some have competed at international level, whilst others have been taught by the Founder of Taekwon-Do. You will learn the complete art – physical, mental and spiritual. Our tutors will make sure you receive the right kind of training for your own particular needs. Results will be fast and impressive and you will train in a safe, friendly and positively energised environment. Mazuki instructors have all had rigorous and intensive training to achieve their professional qualifications. All instructors have professional indemnity and are DBS (Disclosure and Barring Service) checked. They are all skilled in First Aid and, of course, they all hold black belts in Taekwon-Do. Based on complex scientific principles, Taekwon-Do was developed in 1955 by Grandmaster Choi Hong Hi (1918-2002), a General in the Korean army. General Choi (The Founder) combined his knowledge of other martial arts and his appreciation of the human body’s natural movement to create what is the most powerful martial art in existence. Now, over half a century on, it is taught in nearly every country in the world and has millions of practitioners. Like any martial art, Taekwon-Do can be a dangerous weapon if not used correctly. However, central to Taekwon-Do training is morality and the promotion of ethical behaviour. 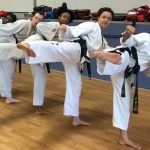 Students are taught to observe the five tenets of Taekwon-Do: courtesy, integrity, perseverance, self-control and indomitable spirit – qualities that the practitioner can transfer to their everyday life. Our instructors teach authentic, modern Taekwon-Do. They are dedicated to the teachings of General Choi, and in their work they honour his spirit and morality.